Though I dearly hope that On Sandwiches stands as the home of the world’s finest sandwich discourse, there are other places on the internet that discuss sandwiches. One of them is The Dwichtorialist, a French operation that features a variety of creations that intrigue and inspire. Imagine my delight when the proprietor of that site made their way stateside and sampled a few of our wares. Everything seemed swell when Umami Burger rated a nine out of 10, but a recent post on Jack in the Box had me more than puzzled. Having tried the sirloin Swiss and grilled onion burger, The Dwitchtorialist rated it an eight out of 10. I’ve eaten at Jack in the Box. When in the right state, I’ve even found it quite enjoyable. But eight out of 10? I had to investigate. 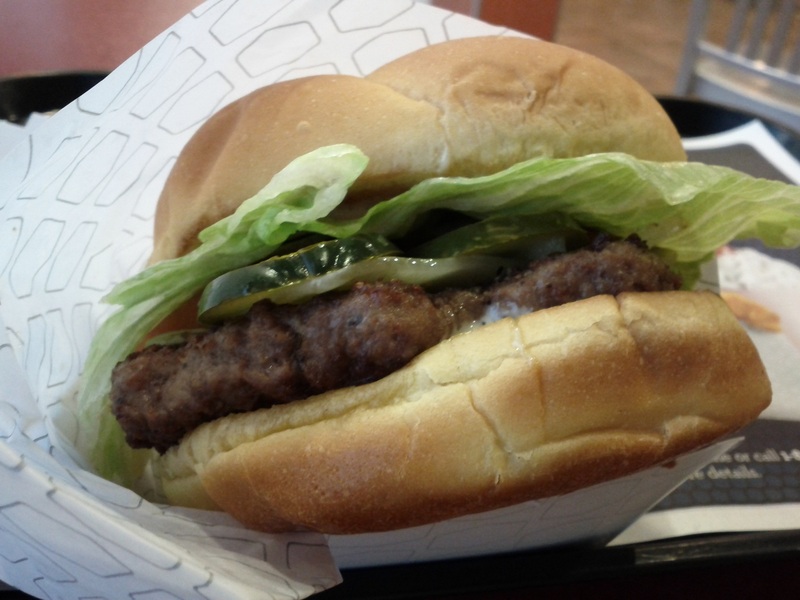 Wouldn’t it be a delight, if Jack in the Box had a burger that was capable of standing with the best? It would, friends, but it isn’t. The burger actually isn’t bad. It suffers from the same thing that hamstrings all fast food patties thicker than average, namely having been cooked dry all the way through. There’s a mayonnaise involved to compensate, and it has a nice peppery bite to it. That’s about where the fun ends, though. The grilled onions are sparse, and fail to bring the sweet notes one would expect. The Swiss is that thin strip you see nestled below the pickles, and the taste is about as strong as the sight. Like most fast food there’s more than a little salt, and overall it..it was a fast food burger. As one would expect, I suppose, but I had my hopes up. It seems to me that this demonstrates the limits of criticism, to a certain extent. I cannot try the Jack in the Box burger as anyone but myself, a denizen of America, a man who has eaten his fair share of American fast food. Consider it a wall of context, one which genuinely can’t be torn down. And that’s so much the pity, given that on the other side of this wall a Jack in the Box hamburger is an eight out of 10. This entry was posted in Sandwich Reviews and tagged Beef, Hamburgers, Reviews by Pete, Slummin It by Pete. Bookmark the permalink. The trick to this burger is to order it with no lettuce (because it’s always going to disappointed) and EXTRA SAUCE! If you’re like me, you’ll do no onions too. Noted! I appreciate the tip, though I’ll stick with onions.